There are so many ways that being obese affects a person's life -- some of you don't realize until you have lost the weight. I used to be the person who did everything for everybody all the time in an effort to get them to like me. I felt that nobody could possibly like me the way that I looked. This left no time for me. I always thought and spoke negatively about myself. I had to be the one to make fun of my size because I thought it would sting less. I had to be in control of everything else because I felt that my body size was out of control. I came to realize that I was living in my comfort zone. I had no hope of my circumstances ever changing. I didn't have any major health problems...yet. With my family history, I knew it was only a matter of time. I did have insulin resistance and very little energy. I did my research and made an informed decision. 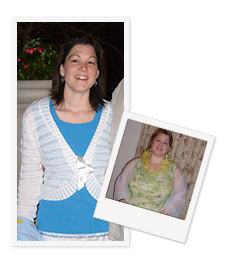 I thought about the adjustable gastric band surgery, but decided that the gastric bypass was right for me. I chose Barix Clinics because the Barix surgeons and staff are specialized. I felt that I was thoroughly informed of all my options and every question was answered. I am glad that I chose Barix. My surgery went smoothly-no problems at all. The hospital was comfortable with all necessary amenities. They even provide follow-up and nutrition counseling. All that extra weight was like carrying the weight of another person on my back. I went from a size 24 to a size 6-8. My life has changed in so many wonderful ways. I have more energy and desire to go out and do various activities. My self-image and sense of self-worth have soared and I feel deserving of a meaningful relationship now. I have so much more confidence in social situations and am likely to strike up a conversation-something that wouldn't have happened at 275 pounds. Being in better physical shape and a better frame of mind makes me a better mom. Everyone asks me the 'true test' question: "Would you do it again, knowing what you do now?" And my answer is, "I'd do it again today!" Don't wait any longer to get your life back!